2017 Retreat – Last 4 Places! relaxing by the Ganges enjoying the ambience of the Himalayan foothills? 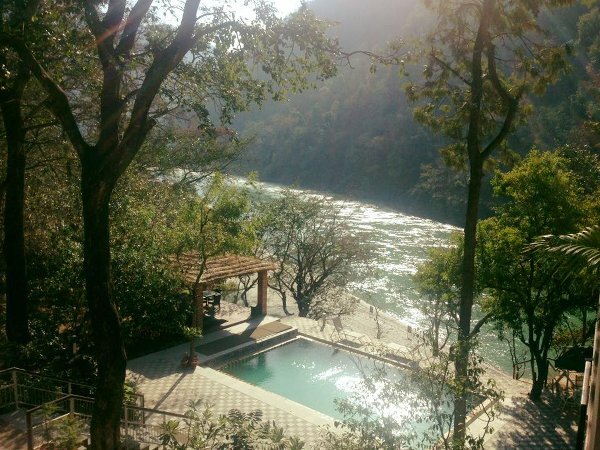 This is a glimpse of our new Retreat location half an hour form Rishikesh – a picturesque Resort set in peaceful natural surrounds overlooking the crystalline waters of the Ganges! We are delighted to have a nice group coming together for our up-coming Retreat, however only four places now remain! 3 Nights at the luxurious Jaypee Siddharth Hotel in central Delhi with breakfast. Includes a day sightseeing and shopping. 6 Nights at the beautifully situated Divine Resort in Rishikesh with rooms overlooking the Ganges (breakfast included). Centrally located in Laxman Jhula amongst colourful shops, cafes and restaurants and a short stroll to the Ganges. 3 Nights to relax and unwind at a peaceful Resort location on the banks of the pristine Ganges surrounded by nature. The Resort offers wholesome vegetarian cuisine made with locally sourced organic ingredients (all meals inclusive). The Resort Spa offers pampering holistic treatments using natural botanically derived products. Yoga classes open to all levels with Nikki Leaf except on excursion days. Complimentary Ayurvedic Consultation with Nikki or Leah. Complimentary Ayurvedic Full Body Massage – Snehana – with Leah. 1. one day trip to Devprayag: the sacred meeting place of two rivers Alaknanda & Bhagirathi followed by lunch at Ashram in magical mountain setting. 2. visit to Kunjapuri Temple with stunning view of Himalayas followed by lunch and waterfall / forest walk. Traditional music and dance evening with snack foods. All transfers inclusive (excludes airfares). Nikki Leaf and Leah Albrecht, your Yoga and Ayurvedic practitioners and facilitators on your journey to Rishikesh, have had extensive experience travelling in India over many years and have developed close liaisons with local tour operators to make your trip a safe and enjoyable experience at all times. Our chosen accommodation is clean and comfortable and we favour good quality eating places at all locations. Nikki Leaf is the director of the yoga centre at Yogaveda and has been teaching since 1987. She is also an Ayurvedic practitioner and integrates this knowledge into her teaching. Nikki focuses on developing a mindful yoga practise which is inspired by the Hatha/Iyengar style. Leah Albrecht is the director of the Ayurvedic Studio at Yogaveda. Leah qualified as a Ayurvedic Practitioner in 2002 after a long-standing practise of yoga – its sister science. She went on to complete a post-graduate diploma in Marmapuncture (Ayurvedic Acupuncture) and traditional Chinese Acupuncture. If you would like to join us please contact us very soon as places are strictly limited.